On November 8, 2017, we had a soft launch of our new website with the intention of working out the bugs before its official launch. Our mission: to deliver a bold and clutter-free site that aligned more closely with our vision, and that showcased our images and video in a way that provided a better viewer experience. Designing an effective website incorporates many factors and requires the skill to wear many “hats” and requires the adroitness of mind to keep alternating those hats. In the past, due to our lack of coding knowledge, we were restricted to utilizing website platforms like Homestead, WordPress, and Joomla, which allow building a website without needing to understand coding. However, they just didn’t provide us the look and feel we wanted. After many tutorials on coding from the school of YouTube, we moved our website to Squarespace; they provide us with the platform we needed, and allowed us to customize their templates to fit our style objectives. The visual aesthetics of the STUDIO BUMS® site uses simple typography that complements our iconic SB logo. It also makes use of more white space with a minimalist footprint. Immediately upon landing on our homepage you’ll see the iconic SB logo centered at the top, with the navigation bar below the logo. There, you will find the following links: “STUDIO BUMS®” (takes you to the homepage), “INTERVIEWS” (with drop-down access to VIDEO INTERVIEWS, SB BLOG), “2018 LOOKBOOK”, “SHOP” (with with drop-down access to MEN, WOMEN, HATS, EXTRAS), “ABOUT” (with drop-down access to US, CONTACT, FAQ) and, lastly, “WEBCOMIC”. While exploring our site, you’ll catch a glimpse of the STUDIO BUMS® brand in motion through our short video banner presentation (no audio). The video was shot by Cristian Kaigler of Safe House Media Group. Scrolling down the page, you’ll see the fade effects on the video or fallback image. Currently, the video banner doesn't support fade effects or videos on a mobile device or tablet (coming soon, though!). Mobile and tablet users will see a mobile fallback image in place of the video. Scrolling from the top banner of the website brings you to our “Featured Products” block, which showcases our latest T-Shirt designs. Right below the “T-Shirt” thumbnail is a digital billboard linking visitors to our 2018 Lookbook. The “Night Owl” collection banner is front and center, as a visual aid making it more straightforward for you to access our Lookbook. STUDIO BUMS® co-founder, ARTEMIS, shot the “Night Owl” Lookbook, with additional images courtesy of Cristian Kaigler of Safe House Media Group. At the bottom of our homepage, you’ll find quick access to THE SHELTER Blog articles. The carousel design block gives visitors navigation control to view catalog content beyond the default display. The Footer on each page includes a link to our “TERMS & CONDITIONS” and “SHIPPING INFO” for our visitors’ convenience without having to search for hidden links. STUDIO BUMS® social media icons are also easy to spot on the footer page. 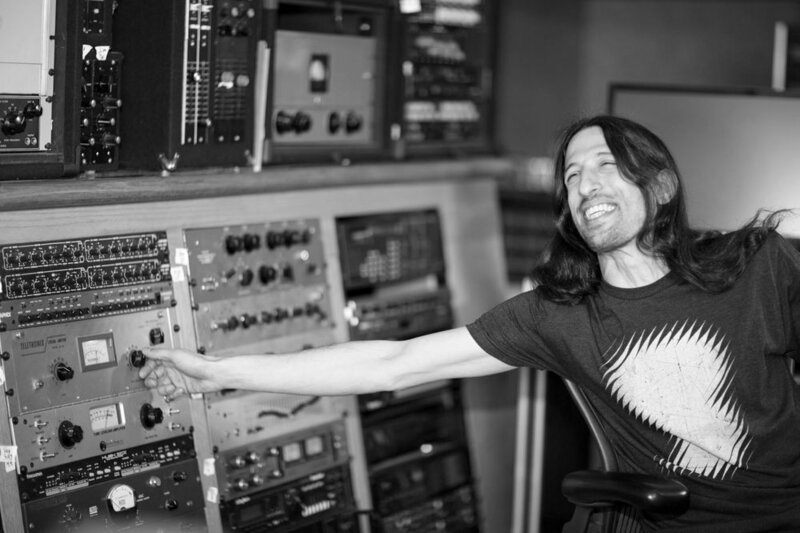 The “SB Blog” page contains a mix of a short and long-form text of music-related interviews, articles, and stories/journals behind the brand’s vision. 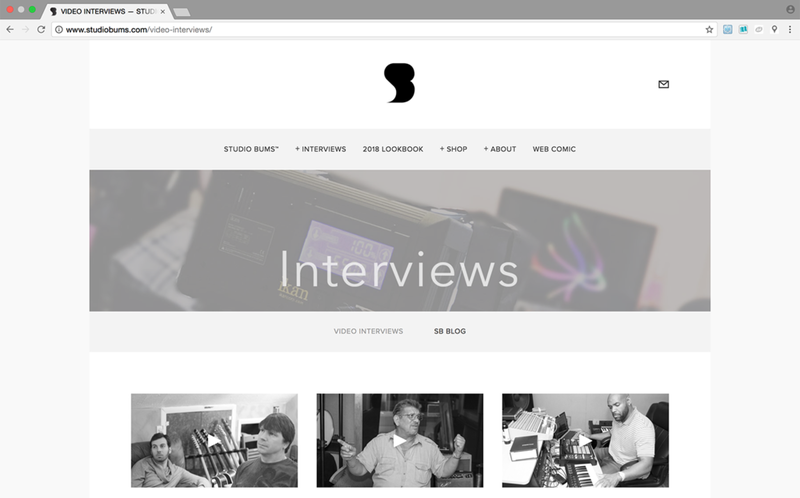 We chose a gallery block layout to achieve the same consistent look as our video interview page. The title/headline of the content appears below the thumbnail photo. It was of paramount importance to build a clean platform to showcase our video interviews, articles, and blog pages in an engaging and user-friendly format. The gallery block layout for our video page gives viewers access to scroll multiple thumbnail photos of the video interviews. The thumbnail photos cite the names of the individual featured talent, with the most recent videos in color, and the “older” ones in black and white. We knew that the shopping experience also needed to be enhanced from the user-experience of the previous version. As such, we switched from using Shopify e-commerce to Squarespace Stripe, because of Squarespace’s all-in-one solution. We also found their presentation very complementary to the overall look of the SB site, and the custom WYSIWYG editor made the editing process so much less painful. Stripe provides Fast and Secure Transactions that we know will be more appealing to the STUDIO BUMS® customer. Our product page organization design gives each product its own category — Men, Women, Hats, Extras. Also, we’ve incorporated more details on the STUDIO BUMS® merchandise; for example, each T-shirt has a story behind its design, as do the novelty items. Visitors can email us directly by clicking on the email icon located on the top right side of the STUDIO BUMS® homepage. Connecting with us via email, snail mail, and by phone is welcomed. Our contact page includes a simple form and our mailing address for your convenience. We anticipate the STUDIO BUMS® website to evolve as the brand continues to evolve. Video content and music-related articles will be uploaded at a minimum of twice each month. We are constantly looking for ways to enhance the viewer’s experience, so please look around and send us a tweet or leave a comment with your feedback. We feed off your creative energy.